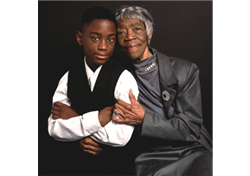 Academy-award-winning documentary about Viola Dees, age 89, also known as “Big Mama”, who cares for her 12-year-old grandson, Walter, whose parents are absent. But is she the best person to raise him? Over the course of 18 months, Big Mama, suffers serious health problems, with severe emotional consequences for Walter. While contending with her own declining health, and a bureaucratic social and legal system, Dees fights the misconception that age supersedes one’s ability to love and care for a child. “When, exactly, are you too old to love your own grandchild?”, she asks.